The mission of the ASI Rare Coin Program (RCP) is to make the very best investment grade rare coins easily available to you so you can own them with confidence. The RCP was one of our most successful programs in 2014, and is slated to grow faster in 2015. Coins we feature are often sold out within 48 hours of our articles being published. This does not surprise me. Savvy investors know rare coins are a protection against inevitable market downturns. If you hold 50% or more of your net worth in stocks and bonds, your portfolio may be at risk in the event of a market pull back. In 2008, the average investor had to earn 67% on the 'surviving balance' just to get back to pre-crash levels. The DOW has already dropped nearly 2% in the first three weeks of 2015! Rare coins stabilize your portfolio so this should not happen to you - regardless of market events. This year, our RCP expert, Doug Winter, went to the January Florida United Numismatic (FUN) show with all guns blazing. His purpose was to handpick undervalued rare coins, significant rare coins and those with high growth and safety potential to offer through the ASI Rare Coin Program. The FUN show is one of the premier numismatic events in the world, with 600 dealers, top auction companies and thousands of avid collectors all vying for the best coins for investment or to grow their collection. We knew only Doug could see the forest through the trees and bring back the best. He is a savant at identifying undervalued coins to add growth as well as safety to your portfolio. If you haven't met Doug, he is the world's leading expert in pre-1933 rare U.S. gold coins, the author of 13 top books on rare coins and a member of every credible rare coin and numismatic group you can name. 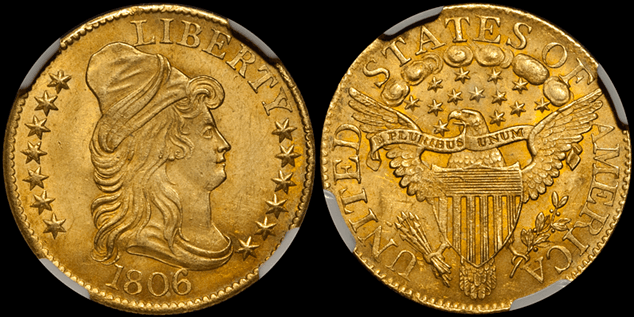 When PCGS (the top third-party coin grading company) was establishing their grading of U.S. gold coins, they consulted Doug on the proper way to create their grading criteria. He was also a speaker at our 2014 Precious Metals to Rare Tangible Assets Conference. You can watch his presentation here. Capped Bust Right Heraldic eagle reverse half eagles were made from 1795 through 1807. The early dates tend to be rare, and most collectors focus on the issues made from 1800 to the discontinuation of this design. This type is generally available in the lower Uncirculated grades, but it is rare in MS64 and extremely rare in Gem. In fact, an MS65 will cost you over $100,000... if you can even find one! This 1806 Knobbed 6 represents an excellent type coin as it is a comparatively available date which gets no rarity premium. This example shows nice natural russet-gold color and clean, lustrous surfaces with crisp, clear details on both sides. NGC has graded 36 in MS64 with only two finer, and it is probable that the MS64 population is well inflated by resubmissions. The PCGS Price Guide suggests a value of $61,500 for this issue in MS64, and the most recent auction trade for an NGC MS64 was $41,300 in June 2014. This exceptional piece of early gold is an important piece of early American history and it will become a centerpiece of a savvy investor's portfolio. Many of our RCP clients had Doug handpick rare coins for them directly at the FUN show. If you did not take that step, it's not too late to participate. But, time is very short to claim the best of the best. There are just a limited number of treasures left. Click here to view other selections from the show at a variety of price levels. We are offering the few unclaimed coins from the FUN show to you on a first-come-first-served basis. Remember, rare coins are just that - rare. If one sells, it is gone. There are no duplicates. Do not miss out. If you are interested in buying, or have selected a rare coin from our website, call me now at 877-340-0790. If you want to know more, schedule a call with me or send me an email. There is no obligation to buy. You will immediately be called at the number you provide in your email and we will explain to you the details of the Rare Coin Program. There is no obligation! But, if you wait too long, you may not get the best of the best FUN coins. Call me at 877-340-0790 or send me and email to schedule your consultation.